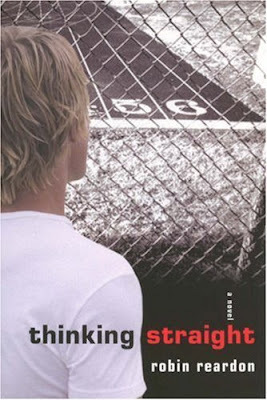 Thinking Straight is author Robin Reardon's second novel. I have yet to read the first one, A Secret Edge. But if the second' style of writing and tired, old theme is any indication, then maybe I can skip the first one. Thinking Straight has a simple plot. Taylor Adams develops a budding love relationship with a schoolmate. But his fundamentalist Christian parents are hell bent on him acting all butch, dating girls included. Taylor, the good son that he is, tries to accommodate his parents' wishes, but ultimately succumbs to the higher calling to keep faith with truth. So Taylor comes clean with his parents, much to his regrets, although you wonder how Taylor could not have anticipated their reactions. His parents packs him of to Straight to God, an institution dedicated to "deprogramming" all kinds of troubled teenagers such as druggies, alcoholics, and gays. But Taylor does not see himself as needing any such deprogramming; not only does he not have a problem with being gay, he can also reconcile his love for God with his love for his boyfriend, Will. At this institution, Taylor must deal with a repressive culture. Every movement is closely watched, and privacy is almost non-existent. Reardon throws in a few good-looking guys who serve to tempt Taylor to return to his "sinful" life. But will he? As you can tell, the story is quite predictable. And quite depressing too. What makes it worse is the lack of sophisticated character development--Taylor's parents are two-dimensional, and Taylor himself comes across as whining and unsympathetic. Don't look for lyrical prose in this novel; in fact, we rarely get descriptive settings or philosophical waxings in this work. Read this novel if you are a complete novice to this notion of gays being brainwashed by church-affiliated organizations. Otherwise, you can do better.